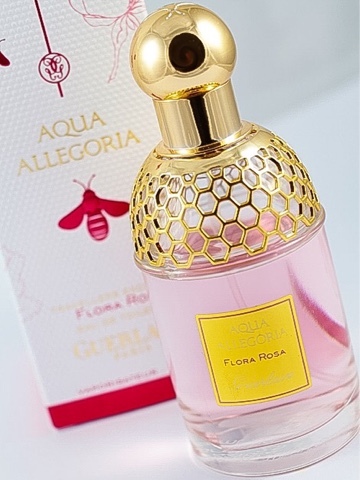 I was recently scent the beautiful Guerlain Aqua Allegoria Flora Rose fragrance, the BeautySpin website also has many other fragrances from the Aqua Allegoria range by Guerlain. The packaging of this fragrance is what really stands out to me. The top of the gals bottle is designed like a bee's golden honeycomb. The detail is so intricate and beautiful and it really transforms the look of this fragrance. Removing this aspect leaves a plain glass bottle which really limits the initial impression of this fragrance in my opinion. The lid is also a beautiful gold which has a bee engraved on the top which really pulls the entire bottle together. The fragrance itself is a beautiful baby pink which really helps to pop with the shade of the label. The label is yellow with a gold border and the font reads the fragrance group, name and brand. This is a very light and lively fragrance which really lifts my mood when I spray it. It smells very feminine whilst not being too sickly and girly. I think this fragrance is most suitable for throughout the day and during the spring and summer months, however this fragrance would be lovely for the transitional months, for example through the transition of summer and autumn. This palette is slightly less long lasting than most perfumes because this is an Eau De Toilette but nevertheless the scent lasts a few hours.